Preparation for this Sacrament will begin on Thursday 26th February. Classes will be held in the Parish Centre at 5.15 pm and last until 6.00 pm. Parents should complete application forms now available from Fr. Michael. A useful resource for daily prayer during Lent. Copies are available at the back of church and cost £1. Thank you for the offering of £610.34 last weekend. 227 were at Mass. This year we’ll have a ‘Book Club’ style study group using the book Holiness for Everyone by Eric Sammons. 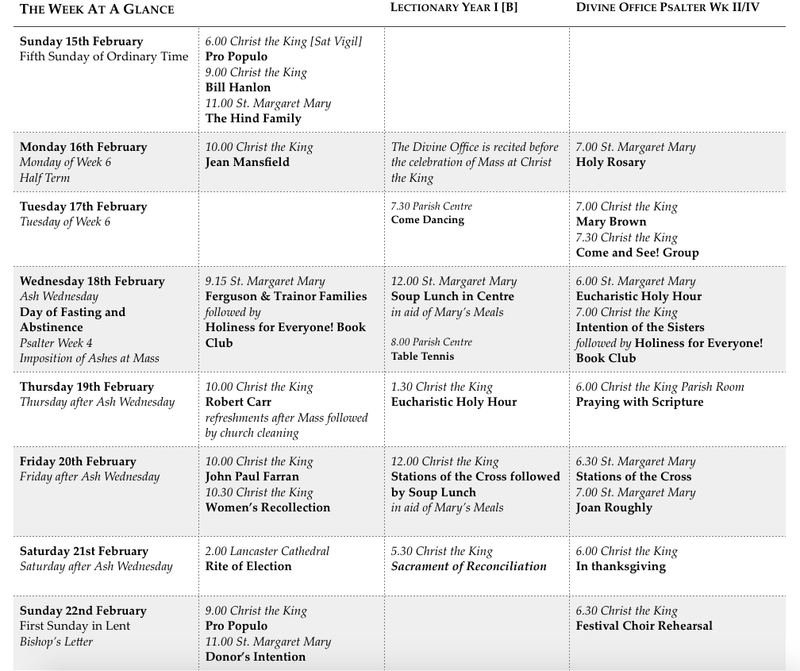 The whole book should be read and we’ll discuss a particular chapter each week on Wednesday after Mass [St. Margaret Mary] and at 8.00 pm [Christ the King]. All welcome. Meets on Tuesday evenings after Mass. All non-perishable items welcome particularly UHT milk, small bags of sugar, tinned sponge puddings, custard (tinned or packet instant), tinned tomatoes and cereals. Monday to Wednesday 10.00 - 2.00 and Sunday 12.00-3.00 pm. For more information contact the centre manager, Trevor Tiffin on 524295. Donations will be gratefully received for flowers for Easter for St. Margaret Mary Church. The Triduum will be held there. Any amount you can afford will be most welcome, donations can be left (in an envelope marked ‘Easter Flowers’) in church or with Mrs Mary McGuiness. On Fridays in Lent. Please consider attending this opportunity for prayerful reflection on our Lord’s saving death. There will be soup lunches during Lent in aid of Mary’s Meals, a charity that provides meals for school children in poorer countries. On Wednesday at St. Margaret Mary in the parish centre and on Friday at Christ the King. If you can provide a pan of soup [which should be meat free] at Christ the King, please see Mary Scott or Mary Richardson. 22nd Feb, 8th March, 15th March, 22nd March and 29th March. All dates are Sundays beginning at 6.30 pm. The first meeting will be at Christ The King church. Once again, St Margaret Mary SVP will be organising distribution of food parcels before Easter for those in need. We hope to deliver the parcels the week beginning Monday 23rd March. Please leave items in the box at the back of church, having checked the best before date. Thanks to your continued generosity we were able to distribute 53 large food parcels to local families before Christmas 2014. Thank you for your continued support. The next date is Saturday February 28th at St Edmund’s Church, Orton Rd, Carlisle. Our speaker will be Michael Jordan. All welcome. Renewal days start at 11.00 am and finish around 4.00 pm. Please join us even if you cannot stay for the full day. Tea and coffee provided, please bring a contribution to a shared lunch. Contact: Janice Wrench -01768 868489. There is a meeting of the Deanery Pastoral Council on Wednesday evening at St. Augustine’s. Parishioners are needed to volunteer for this important ministry in the Church - especially younger parishioners. To proclaim God’s Word during the celebration of the Mass enables God to speak to us and touch our lives. Please consider coming forward for this ministry. Adult men and boys are needed to assist with the celebration of Holy Mass through the ministry of serving. Not only does this add dignity to the celebration of Holy Mass but enables greater participation of all who are present. We have a good and faithful team of servers at St. Margaret Mary but none at Christ the King. The Mass is never a ‘solo performance’ - help is needed in this area. Please consider coming forward - Mass can only really continue in churches where people are willing to be involved and actively so. There will be a meeting of the Parish Pastoral Council on Thursday evening at 7.30 pm in the Parish Centre. This Friday. Envelopes will be distributed this weekend. Please use the envelopes. 9.15 am at St. Margaret Mary and at 7.00 pm at Christ the King. It is a day of Fasting and Abstinence from Meat. Preparation for this Sacrament will begin on Thursday 26th February. Classes will be held in the Parish Centre at 5.15 pm and will last until 6.00 pm. Parents should complete application forms now - available from Fr. Michael. Thank you for the offering of £583.20 last weekend. 219 were at Mass. Meets on Tuesday evenings after Mass for those interested in the Catholic Faith. A catechumen is one who is approaching the sacrament of baptism. On Wednesday evening, the adults who will be baptised on Holy Saturday night will be received into the ‘Order of Catechumens’ during Mass. On Saturday, they will attend the Rite of Election at Lancaster Cathedral. Please pray for them. All non-perishable items welcome particularly: UHT milk; small bags of sugar; tinned sponge puddings; custard (tinned or packet instant); tinned tomatoes; cereals, etc. The Ladies Group meets on the first Tuesday of the month in the parish room at St. Margaret Mary. The group is open to all and you would be sure of a warm welcome. We had a very interesting meeting last week with a talk on Working with the Deaf and Sign Language. Once again St Margaret Mary SVP will be organising distribution of food parcels before Easter for those in need. We hope to deliver the parcels the week beginning Monday 23rd March. Please leave items in the box at the back of the church, having checked the best before date. Thanks to your continued generosity, we were able to distribute 53 large food parcels to local families before Christmas 2014. Thank you for your continued support. Try "Prayer with Scripture" this Lent with our prayer group every Thursday at 6.00 pm at Christ the King or on your own at home. 4. Contemplation - Stay in God's presence and be open to receiving whatever God wants to give. 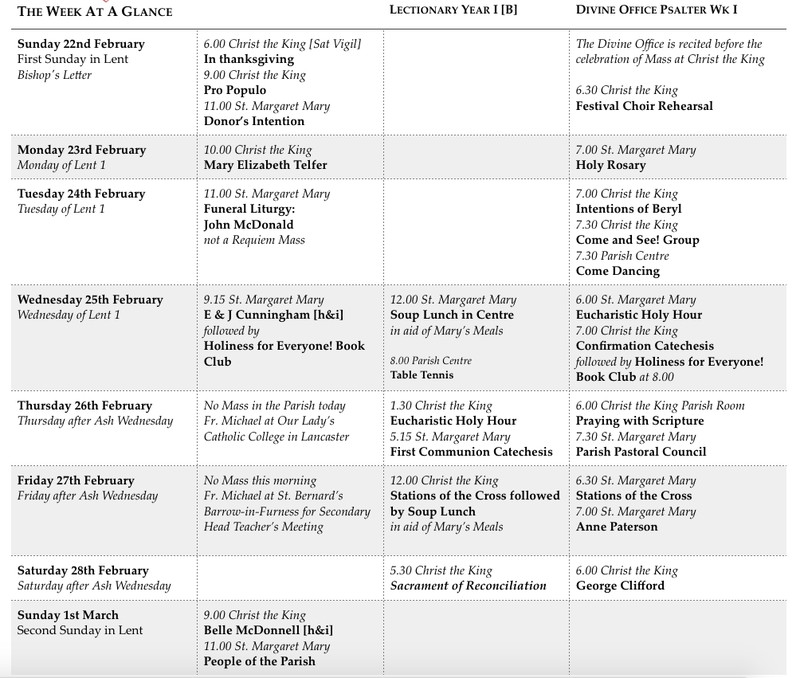 A guide to Lenten activities in the parish will be available to collect on Ash Wednesday.